A complication with AWS billing is the manner in which it distributes AWS Credits. Generally, when a customer applies a credit to a payee, the credit is applied across the entire Consolidated Billing Family (i.e. to all the payees in the family). The percent of the credit that is allocated to each payee is not obvious but there is an algorithm in place that assigns the credits across many payees. Here's an example of this situation: A user enters a code into AWS for a $50 credit from a survey they completed. Their expectation is that the credit would be applied to their own account. However, AWS sees that entered credit and spreads that amount across many of the payees in the Consolidated Billing Family. This can result in entirely unrelated accounts receiving a credit that was not originally theirs, and the original user only getting part of that $50. CloudCheckr allows you to manage how credits are distributed. To start, if you are reselling AWS we suggest under the Payer account in CloudCheckr that you configure your account to Hide Credits from payees unless manually assigned. This is set in the navigation column under Account Settings > Detailed Billing Bucket. When this option is set, the Payees will not see any credits until you specifically assign the credits to the Payee. Choose which specific credits to either pass on to or hide from users. Consolidate credits that are spread across multiple Payees back into a single Payee. Allow you to create rules (in the form of regular expressions) to automatically assign credits to specific payees. Allow you to create custom credits or simulate Credit Memorandums from AWS that you can flow to payees as appropriate. To assign a credit to a payee, go to the Cost > AWS Partner Tools > Assign Credits. Within this screen you can see the Credits by account or by description. From here you can review and assign the credits to the appropriate Payee accounts. As an Admin user within CloudCheckr, you will always be able to see what credits have been assigned to what account by AWS, but also will have complete visibility into what payees you have assigned the credits to flow to as well. Often, AWS will spread a single credit amongst many payees (this is the default AWS behavior)—to see credits from this point of view you can go to the next tab. Credits by Account will show the credits from the point of view of the account. Each individual account will have a line item for each individual credit it receives. For the Payee to see the credit, they can go to Cost/AWS Billing/Other Features/AWS Credit Summary. From here the end customer will see the credits that the reseller has assigned and only those credits. To create rules for credit assignments, you can use RegEx expressions within the Assign Credits Rules report, which is accessible via the green button within the Assign Credits report. You will enter RegEx text in the Rule: textbox, choose a recipient in the Assign To: pulldown menu, and then click the Add Rule button. Once the rule has been added, you can then click the Run Rule button in order to activate the rule. You can make modifications to the rule at any time. This report allows you to add custom credits to the account bill that supplement the records that are collected from the Detailed Billing Report. You can assign credits, as needed, so that they show up in the appropriate account. Enter a custom credit below to see that value show up in the reports. This credit will be reflected in all of the AWS Billing reports in CloudCheckr. You can add Custom Credit Memos to any account. These credits will not be tied to List Cost, and will be treated like all other credits written to the DBR. If you want these credits to appear in payees' accounts, you will have to specifically assign them, as described in the sections above. The report is located at Cost > AWS Partner Tools > Configure > Custom Credit Memos. 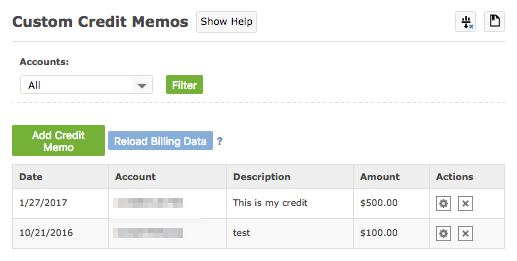 To add a custom memo, you would first click the Add Credit Memo button. Next, you will assign the credit to a specific account and enter in relevant info for date, description, and amount. When you have completed your manual assignment of credits you will need to reload the billing data for month in question, as is the standard practice whenever you make any customization to your List Cost data. This can be done at Cost > AWS Partners > DBR > Reload — details on reloading your data are located here.